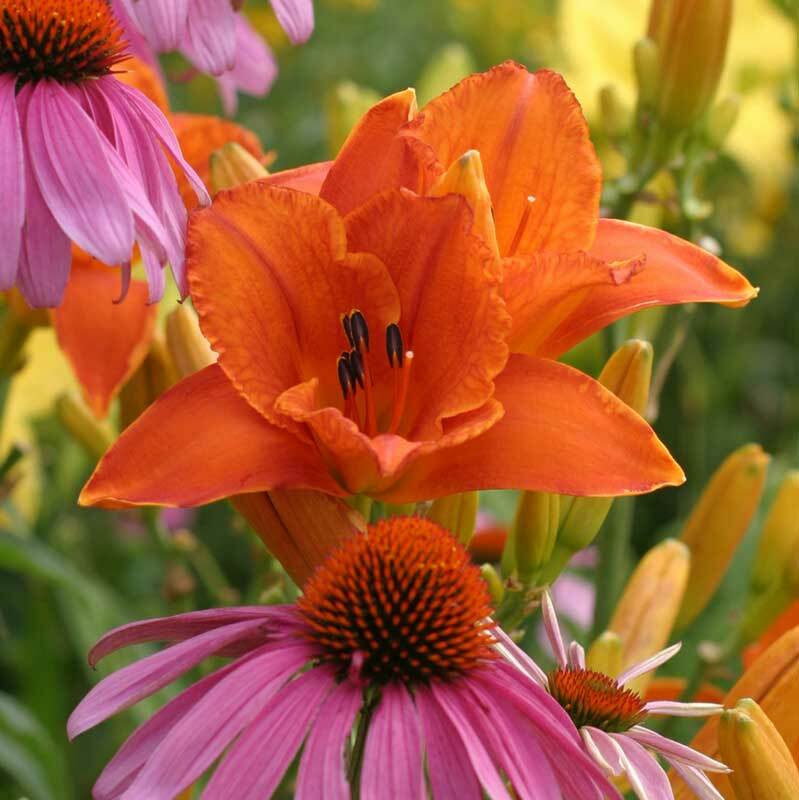 These blooms are lava hot, they’ll catch your eye from across the garden! A favorite of our garden visitors. This is one of the many varieties that seem to take 2 seasons to bloom in my Zone 6a garden (planted in Spring 2015). But worth the wait!! Such a stunning, vibrant pop of color; a deep orange with an undertone of crimson that shines through is the only way i can describe it. Just enchanting and reminds me of the tropics, which is always a good thing in my book. Looking forward to increased vigor and divisions in the coming seasons, not to mention just the sheer visual pleasure! Mauna Loa is planted near the curb at our house, and you can see the blossoms as soon as you turn the corner. It never fails to make me smile when I come home. Prolific bloomer. I just got my plants in April and they bloomed in June. The orange is beautiful! 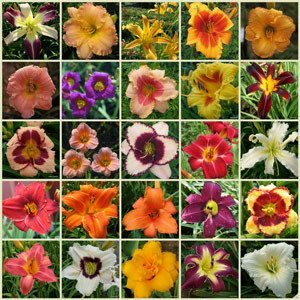 Great choice of reblooming daylily. A vibrant tropical orange that has been a PROFUSE bloomer in my garden for the past three seasons. Very hardy. Thrives in full sun. This is a stunner-such an orange that seems to glow!! I divided them last year so will enjoy the years to come with these beautys. Gorgeous! 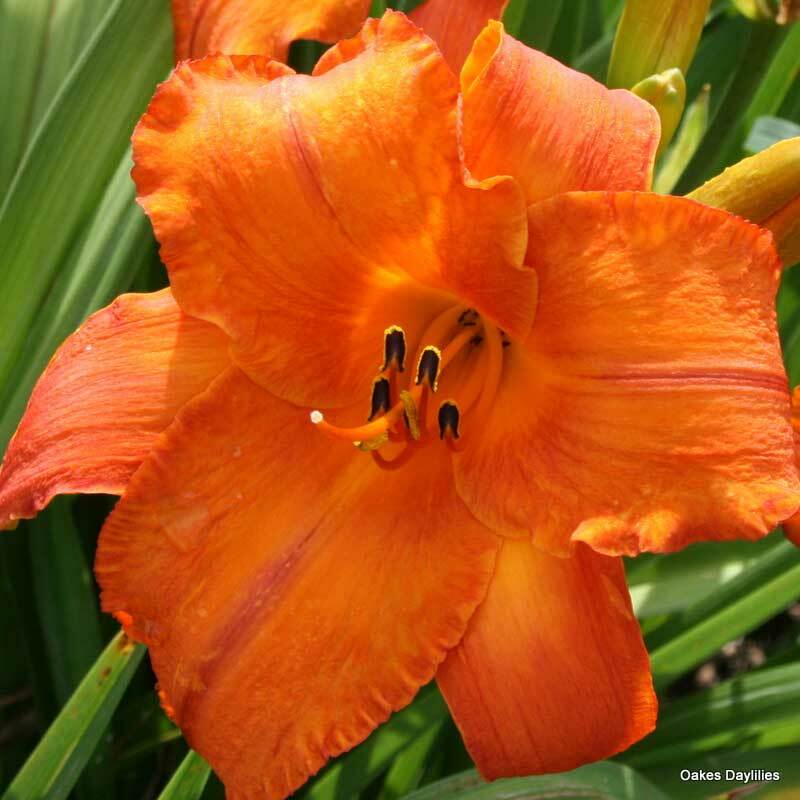 This is one of the most beautiful colors I have ever seen in a daylily! Mine bloomed darker (and prettier) than the photo here. I wish it had bloomed more profusely and longer, but this is only its first year. I want to accent another part of my small garden with a second one. What a beautiful flower. Mine bloomed for the first time today (5/24) and I LOVE IT. It is exactly like the picture in the catalogue. Wish I had orded more than one (actually got Three or four huge fans) plant. I purchased and planted this one last fall and it has been absolutely wonderful! I like the color better than the photo – less dirty looking and closer to a neon orange with just a hint of coral. Very tropical. Seems to hold up well to full southern sun and Midwestern wind. Though it is not as prolific as some others I am definitely looking forward to it in the garden in the years to come. 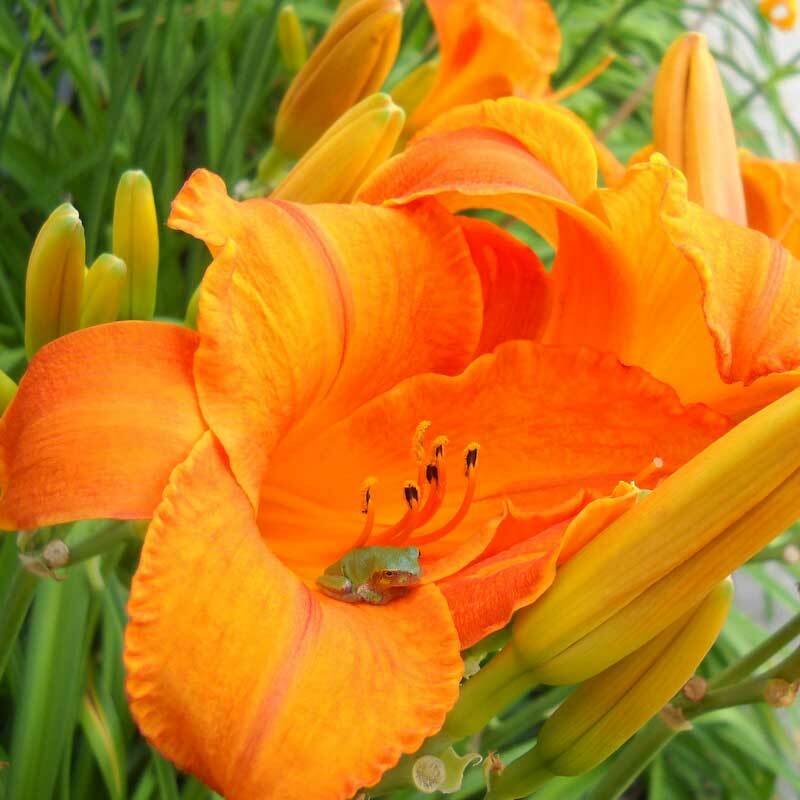 If you love orange – this is the daylily for you. What a beauty!!!! Mine is in it’s third season and the bloom period is a showstopper. I will need to divide it this year and can’t wait to spread it around my yard. 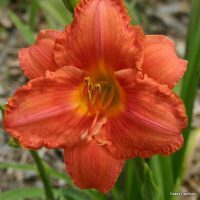 This daylily will knock you over with its color. I can see it as I enter my yard – it’s the first thing that catches my eye. All my neighbors have asked about it because they can see its stunning color from all their yards and they are so jealous! This is the first year for it in my garden; I can’t wait till next year! Buy this plant – you will not be sorry! Planted this last September, and by June 25th it started to bloom. Holey moley — what a color! A very rich coppery orange with a thin midrib of deep red. 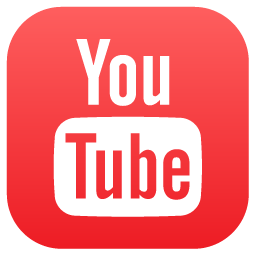 There is nothing else like it. I’ve got it in my “tropical” corner, backed by a dwarf Japanese maple (burgundy) and a very full wine-colored coleus (Merlot). Even better than I’d hoped for. I planted 3 of these in the late spring last year. The folliage came up well, but there were no scapes. This year the plants have come up very well (I will have to divide at least one in the fall), and the scapes are loaded. The blooms are superb. Even lovelier than the posted picture. What a prize! First year growth and bloom were disappointing for me, but the second year was better. Mauna Loa is in its 3rd year of growth in my garden, and I must say, every time I rounded the corner of the garage, all I can say is WOW!!! This is a stunning plant, and such intense coloring. Partial shade seems to draw out even more color than I thought possible. Mauna Loa is a must have for every gardener. This is a sturdy plant. 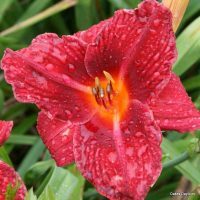 This is an outstanding daylily! It is completely saturated in the most vibrant orange. It’s a commanding knockout! 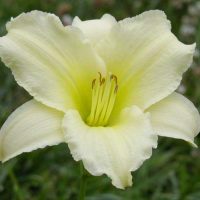 I just bought this daylily last summer and, although it bloomed, there were not many; however, I expect more this season, as it matures. 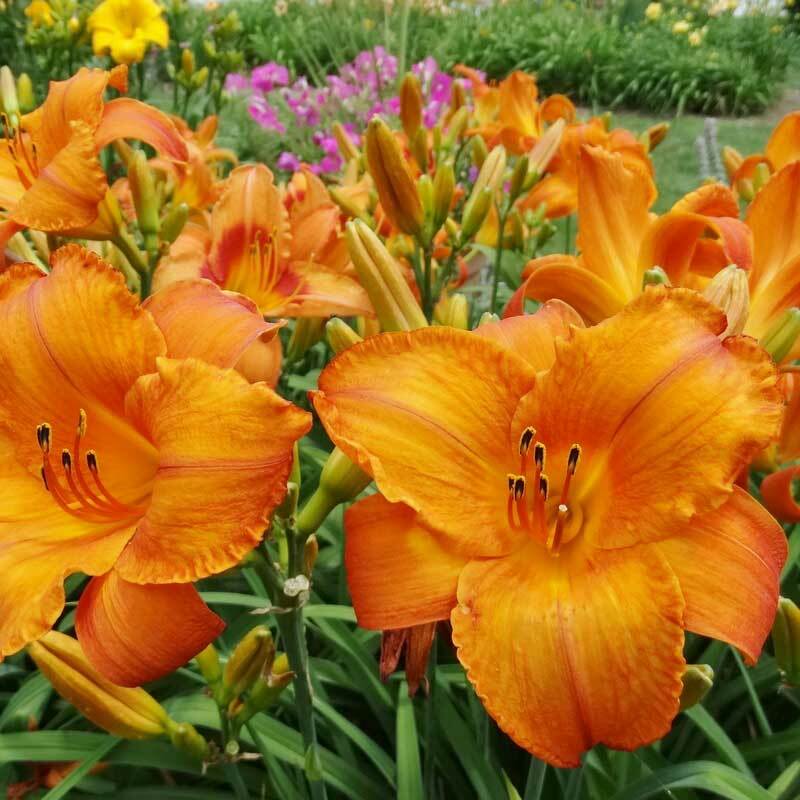 The color is amazing, very tropical looking and the blooms look larger than the 5″. No problem is locating this beautiful, striking flower from across the year. A rich vibrant color that doesn’t fade. Only wish it bloomed longer. 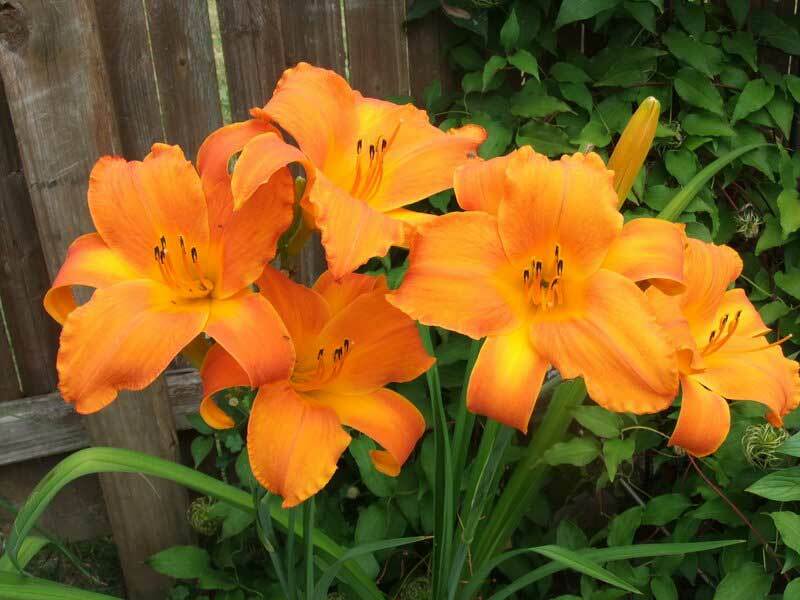 This daylily is a crowd pleaser. It has such color and puts out so many blooms that everyday is a real treat. This is one of my favorites. This is the most gorgeous bright color in my garden. I have Mauna Loa planted in back of Miss Amelia and they look great together! The blooms are big and beautiful!!!!! Truly lovely. I planted along with Stella d’Oro and Tennessee Vols. Mauna Loa blooms just before the Vols thus extending the blooming season. Good results 1st season. Hope it will bloom longer next season. All I can say is “stunningly beautiful!” The blooms were large and tropical – I only wish it was a re-bloomer! I could have enjoyed it all spring-summer-fall! Mauna Loa bloomed today for the first time in my new daylily bed. I planted my Beginner’s Collection about a month ago, and already three varieties are blooming. 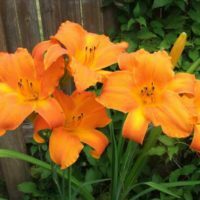 This flower is such a gorgeous color … when it first opens, it looks to be a deeper, more red, orange than in this photo, but as it fully opens and the day goes on, it appears to have lightened. 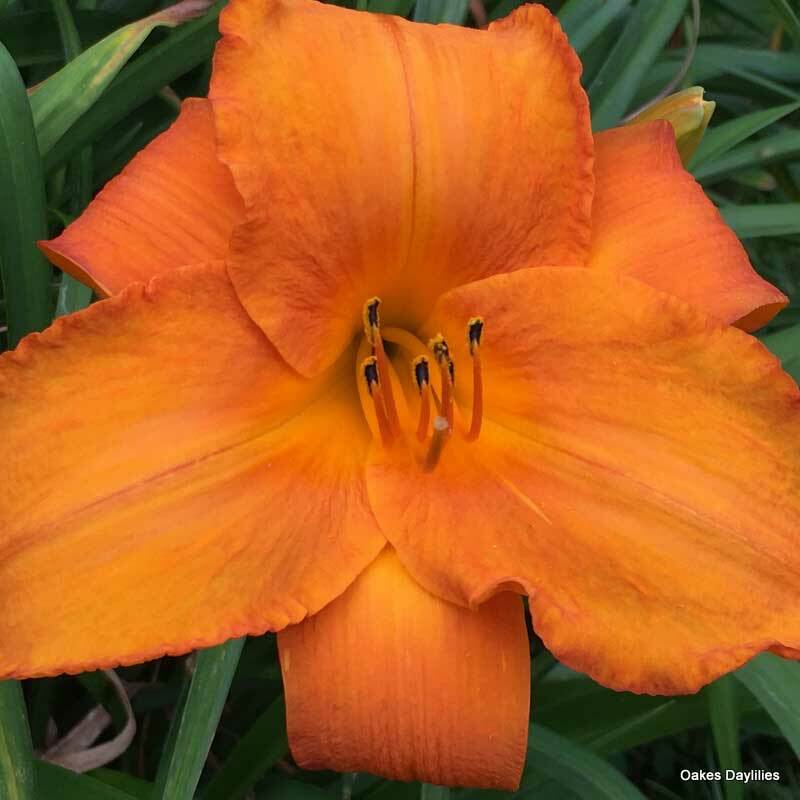 At noon, it’s an amazing orange, streaked and shaded with gold, with lovely ruffled edges. I’m so thrilled to have it in my yard! This flower makes me feel like I’m on vacation somewhere tropical. Awesome color any where you put it. I grew mine in part shade with great results and the color held up better than in full sun. Mauna Loa, the name of a Hawaiian volcano is as tropical looking as its name. 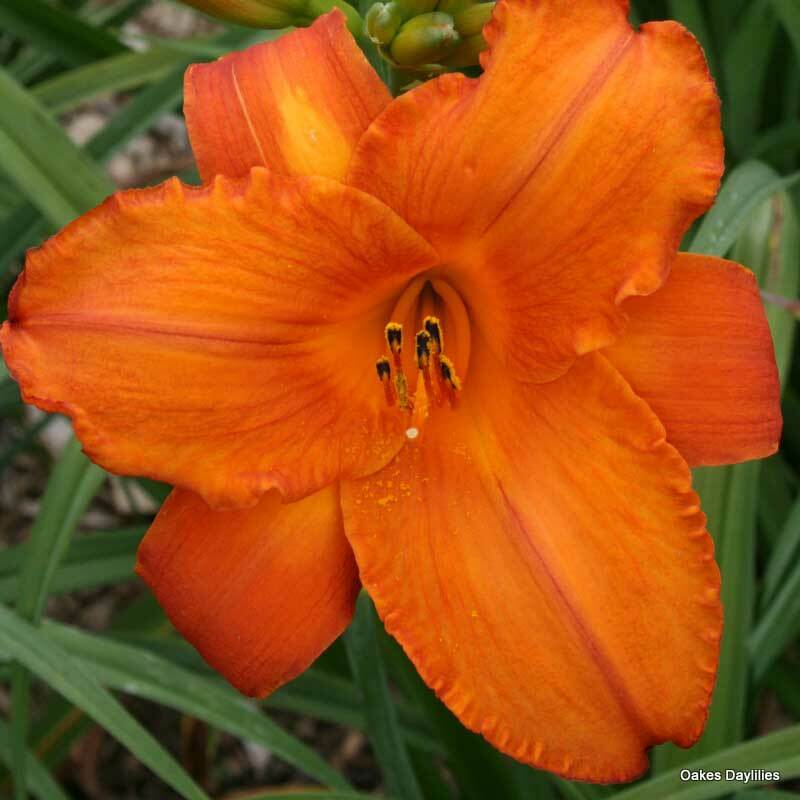 It is one of the most vividly colored daylilies I’ve ever seen. Perfect to jazz up some dull area in you yard . Eye-catching! One of my favorites. Definitely stands out in the garden. Very tropical feel as its name indicates. A must have! Unless you see up close the stunning colors and size of the blooms, a picture doesn’t do this beauty justice. It is one of my favorites. There are a lot of 10 ratings on this site but Mauna Loa truly is that beautiful. The tropical orange glows in my garden. Do whatever you can to encourage the vitality of the planting because Mauna Loa multiplies slowly. The color on this page just doesn’t do justice to Mauna Loa. It really stands out in the yard, I had to have a second one. 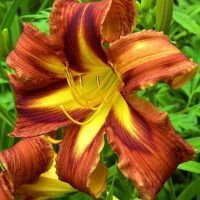 This is one of the most spectacular daylilies I’ve ever seen! Planted behind my pond, it almost eclipses the pond itself. Color is fantastic. It’s now March 24, and Mauna Loa is well on it’s way after a very hard winter.